Are your wrists often stiff or aching? Do you sometimes notice that sharp pains run through them? Are they often weak? Learning how to strengthen wrists is a skill that many people can benefit from, as there are so many who suffer from wrist injuries every year. Problems often stem from the constant use of computers, or from repetitive motion when pursuing hobbies or exercise. Fortunately, there are ways to strengthen your wrists that don’t require surgery. This easy exercise can be done with a tennis ball. 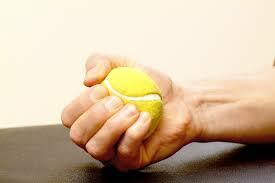 Simply hold the tennis ball in your palm and squeeze it firmly, as hard as you can without causing pain. Hold for 5 seconds, release, then do it again – 10 times in all. 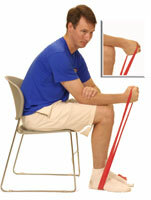 Using a resistance band, wrap it around your fingers with your palm facing up. Hold the band with your feet. Slowly flex your wrist up, tightening the arm muscles. Repeat this 10 times eachfor 3 sets of repetitions. This is quite the same as the upward resistance, except you are going in the opposite direction. Holding the band with your hand, with the palm facing downward, slowly curl the wrist toward you. Repeat this 10 times each for 3sets. Now turn your wrist to the side, so that you are looking down at your thumb. Put your elbow at your side bending 90 degree, and support your forearm with your other hand. Slowly pull the band up by bending your wrist to the side. Repeat this 10 times each for three reps. When asking how to strengthen wrists, this exercise also helps. Stand with your arm at your side and your fingers wrapped around the handle of a golf club. 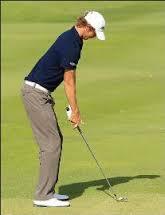 Slowly point the club upward using only your wrist, then lower it very slowly. You should feel a burn in your forearm. 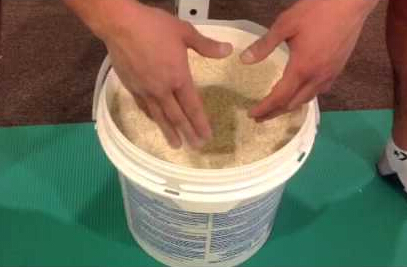 You will need a bucket and plenty of rice enough to cover your hands when they are submerged in the container. Bury your hands in the rice until they are up to your wrists. Then clench and unclenched your hands, move them around in circles in the rice, and curl your hands up and down and from side to side. The rice offers a surprising amount of resistance. This easy exercise works wonders for your wrists. Get into a plank position with your arms and legs straight. Then slowly lower one arm so that your elbow is on the ground where your hand was resting. Do the same with the other side. Then go back up, one arm at a time. Repeat this 10 times. Hold a pair of 3-5 pound dumbbells in your hands with the palms facing upwards. Slowly curl the dumbbells toward your writs using only forearm muscles. You should feel a burn in your forearms. Then lower the dumbbells down to the beginning position. Repeat this curling motion 15 times with both hands. Holding a small dumbbell, stand with your arms hanging down. Allow the dumbbell to roll to the tips of your fingers. Curl your fingers up and use your forearm to pull up the weight. Repeat 10 times each side. Use a sturdy stick or rod, such as a broom handle. Tie a five or ten pound weight to the center of the rod. With palms facing down, start rolling the rod to pull the weight up toward you. Continue until the weight has reached the rod. Then reverse the rolls to let the weight down again. Do this until you are fatigued. Some exercises, such as pull-ups or chin-ups, work your wrists while helping you work other parts of the body. Focus on these exercises, including bicep curls, deadlifts and pulldowns, paying attention to keeping your wrists straight throughout. Do this as often as your regular exercise program calls for. If you have suffered an injury to your wrists, learning how to strengthen wrists is more important than ever. You can perform some range of motion exercises such as the upward and downward resistance exercise mentioned above, coupled with wrist circles. Always follow the advice of your physical therapist when it comes to recovery exercises. As you improve, you can modify the exercises to put more stress on your wrists and forearms. Remember to abide by the “no pain” rule until you have been cleared by your doctor, and even then, stop as soon as you start to feel pain or weakness in the arms.